‘Tis the season for pie: apple, pumpkin, pecan, & custard galore! Pecan pie is a traditionally Southern recipe that Edible Rhody Magazine has added a Rhode Island twist to, with the addition of Sons of Liberty Pumpkin Spiced Whiskey. 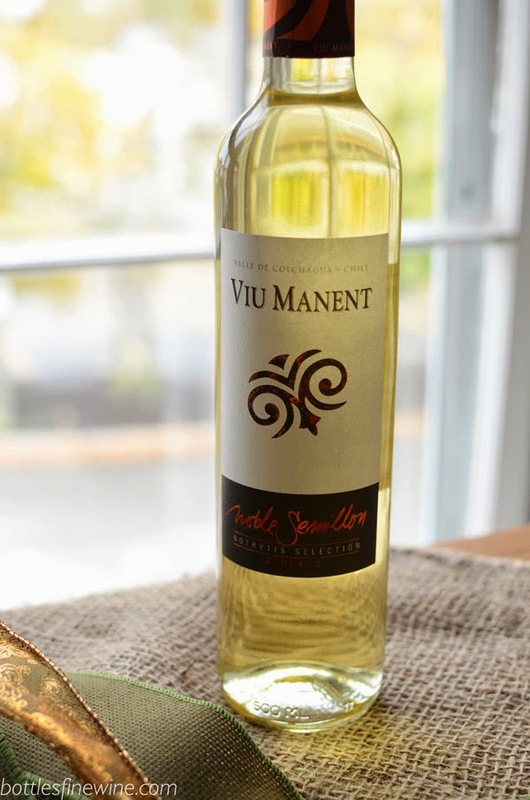 We’ve paired this Thanksgiving recipe with one of our favorite dessert wines, Viu Manent Noble Semillon, a naturally sweet wine from Chile. Read our previous blog post and watch our video to learn more about Sons of Liberty. The word pie has been used in terms of food since the 1300’s and over those centuries, the plethora of pies has increased with all different types. Pecan Pie is one of those and is said that to be created by the French shortly after settling in New Orleans and being introduced to the Pecan, but no one knows for sure. Typically associated with the South, Pecan pie is usually eaten at Thanksgiving and Christmas. With its home in Bordeaux since 1960, the Semillon grape is naturally sweet and vulnerable to Botrytis or Noble Rot. This concentrates the sugars of late harvest wines, making it a perfect candidate for sweet white wine such as the Sauternes from Bordeaux, and the Viu Manent Noble Semillon from Santiago de Chile. When vinified, it takes on flavors of stone-fruits such as apricots, peach, & mangos with back flavor of citrus, nuts & honey with a silken texture. 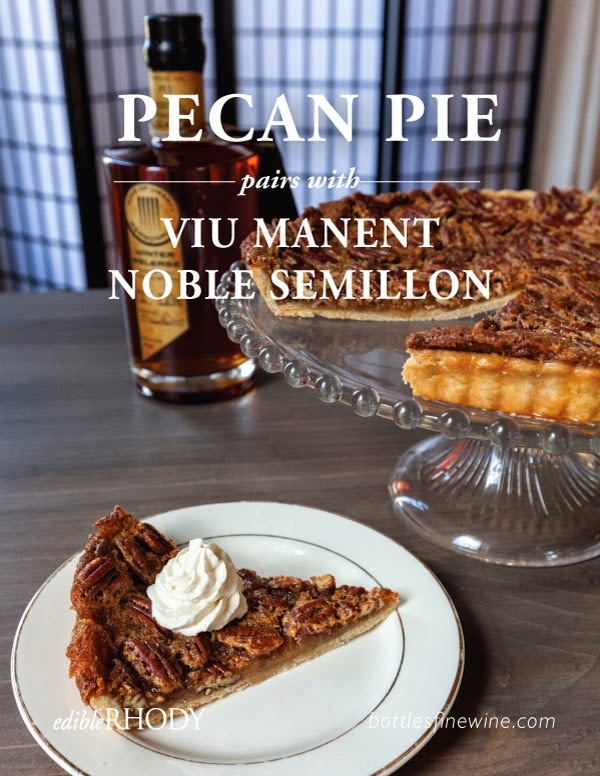 Perfect for Pecan Pie, this wine will bring out that roasted, nutty sweetness of the pecans, the creamy caramelized custard, and the buttery flaky crust. Preheat oven to 425°. In a large mixing bowl, whisk together melted butter with corn syrup, sugar, whiskey, vanilla and salt. Add eggs and mix well. Spread pecans evenly in 10-inch unbaked pie shell (in pie dish or tart pan) and pour egg mixture over pecans. Bake for 15 minutes, then reduce oven temperature to 350° and bake an additional 20–30 minutes or until set but still loose in center. Remove from oven. Allow to cool. Serve slices with a dollop of cream cheese frosting. Makes 1 pie or tart. * This seasonal release can be substituted with Uprising, another whiskey made by local distiller Sons of Liberty, or your favorite bourbon. In a large bowl, mix together flour and sugar. With a large fork or pastry cutter (or by pulsing with a food processor) cut the butter into the flour until the butter resembles small peas. Slowly add water until a dough forms, kneading and working dough as little as possible but enough to form a workable dough. Pressing dough, form a 6-inch disk. Wrap tightly in plastic wrap and let rest in the refrigerator for 1 hour or overnight. Using a rolling pin on a floured surface, roll dough to form a 12-inch circle. Place in pie dish (or tart pan); crimp edges and proceed with recipe. Visit Bottles Fine Wine to get this wine. 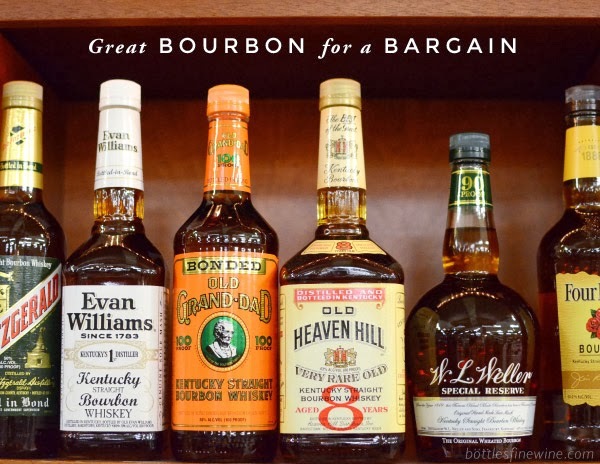 This entry was posted in Wine Pairings and tagged christmas, dessert, dessert wine, holidays, pecan pie, thanksgiving, wine pairing on November 3, 2013 by bottlesfinewine.